There’s a lot at stake right now. A sworn enemy of the Environmental Protection Agency (EPA) was just confirmed to run it. A man who threatens to gut the Affordable Care Act now heads the Health and Human Services Department. From women’s health to immigration to the free press, social justice and equality are being threatened. We are a grassroots, feminist organization dedicated to health justice for all women at risk of and living with breast cancer. We have always relied on our members to power and fund our work, and we rely on you now more than ever. In anticipation of the difficult year(s) ahead for the work we all deeply believe in, we’re trying something new. 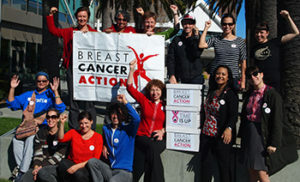 I’m asking you to come learn how to fundraise for grassroots social justice organizations like Breast Cancer Action. This is a vital tool in all our toolkits as we work for what we deeply value: the right to speak truth to power, the right to challenge assumptions, the right to quality healthcare, the right to live in a non-toxic environment. More than ever, we need independent grassroots organizations like Breast Cancer Action; and more than ever, grassroots organizations need community support to fund our work! We’re holding a webinar on March 3rd at 4 p.m. EST/1 p.m. PST where two of our members will tell you all about how they’ve helped raise money for our work from their friends, family and broader community—and actually had fun doing it! Grassroots fundraising is a vital piece of the puzzle for organizations like us, and it’s also a powerful way to build community around the issues we care about. I hope you can join us—sign up here. And if you can’t make it at that time, sign up anyway and we’ll send you a recording of the webinar.